Friendship will take a back seat when British Inter-national School Phuket (BISP) students Mark Vanchai Luangnitikul and Napat ‘Toy’ Paramacharoenroj face-off in the third edition of the Faldo Series Thailand Championship – South. Having suffered the disappointment of narrowly missing out on claiming a medal at last month’s Youth Olympic Games in Argentina, Thai national squad member Vanchai will be keen to retain his title in the eighth leg of the 2018-19 Faldo Series Asia season (November 12-13). Although the main attention in the 36-hole event that is being held in conjunction with the Laguna Junior Open and staged in partnership with the BISP will be fo-cused on Vanchai and Napat, Sebastian Sawtell, Conor Kelly and a five-strong My-anmar contingent all have visions of springing an upset. Sawtell, another talented teenager who attends the BISP, emerged victorious in this year’s Laguna Golf Phuket Club Championship. That success came on the heels of him becoming the youngest winner of the Men’s Championship at Phuket’s Blue Canyon Country Club in 2017. Paul Wilson, Laguna Golf Assistant Vice President/Group Golf Director, said: “We are honoured to have Sir Nick Faldo as our Laguna Golf Ambassador. Our team at Laguna Golf is proud to have the association with Sir Nick and his Faldo Series. “With so many outstanding young players in the field next week, it promises to be a thrilling tournament, once more emphasising the tremendous strength in depth that there is in junior golf across Thailand. 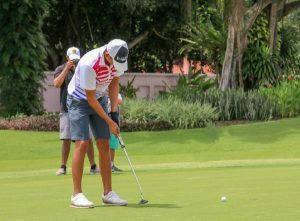 This year marks the third time that Thailand has hosted two Faldo Series Asia qualifiers with Navin Sakunsirasuntorn having upstaged some of his country’s leading juniors to emerge triumphant in the 13th edition of the Faldo Series Thailand Championship (North) at Watermill Golf & Gardens at the start of August. Today, 40 Faldo Series tournaments take place in 30-plus countries worldwide, touching more than 7,000 golfers each year. Past champions include Tseng Yani and Rory McIlroy, both multiple Major winners, while Thidapa Suwannapura (2010 Faldo Series Asia Grand Final Girls’ champion) and Nasa Hataoka (2016 Faldo Series Asia Grand Final Girls’ champion) have both won on the LPGA Tour this year.